Todd’s Mow N’ Plow is a local, independently owned, Minnesota based company. I started my lawn service out of my parents’ basement in 1998 while still going to school. Since then I’ve developed a passion for providing my customers with the best lawn service available. At Todd’s Mow N’ Plow, we know lawns because that is our focus. We do not landscape, install sprinklers, do handyman work or manage pest control, instead we stick to the lawn and that is why we’re the best. Please read on to learn about the many services Todd’s Mow N’ Plow can offer you. Whether you are looking for your home, association or business Todd’s Mow N’ Plow can help. No job is too big, no job is too small. While there is no “magic pill” to achieving a better lawn, Todd’s Mow N’ Plow follows five basic steps to give you a lush and healthy lawn you’ll be proud to walk over. Step 1- We mow at the correct height for the corresponding time of the year. Step 2 – We sharpen our blades weekly. In fact, sometimes we sharpen them as often as three times a week. The mower doesn’t matter nearly as much as blade condition. A dull blade will tear grass and those jagged edges will make it harder for the grass to fight off pests and disease. Step 3 – We will help with your lawn’s water intake. Overwatering causes more damage than not watering enough. Most grasses can handle dry spells but they cannot take flooding. Lawns normally require 1-1.5” of water a week. This is enough to moisten the soil 4-6” below the surface for clay soils and 8-10” for sandy soils. Don’t guess how much water your lawn is getting, measure. Place an empty tuna can in your lawn and time your sprinklers. Continue to water weekly the amount of time it took for your sprinklers to fill the can. Of course, you need to follow local regulations when watering bans are in effect, but grass is a resilient plant and when moisture returns your lawn will come back. Step 4 – We have fertilizer programs to give your lawn a balanced diet. We have a specific program for your lawn. As a rule 4-6 applications will keep your lawn looking good all summer long. Step 5 – We believe prevention is the best medicine. Preventing problems is better than fixing them and consistence maintenance is the key. We are able to repair bare spots, treat for weeds and inform you of any problem before they arrive. Click on the 'Contact Us' button for a free estimate and see how Todd's Mow N' Plow can help you achieve a great looking lawn all summer long. Remember we are a Lawn Service, we don't landscape, do handyman work or pest control, we do lawns and we are the best. Starting in 2015 we will only be fertilizing properties we mow on a weekly basis so we can see the lawns needs and address any issues as they arise. Thank You. Todd's Mow N' Plow has a Fertilizer Program to fit your needs. Here is an example of one. Application #2- Weed N Feed- Late May - If your lawn is doing good we use a granular fertilizer, if the weeds are rampant we use a liquid fertilizer for quicker results in killing the weeds. Application #3- Summer Weed N Feed- Early July - Our summer weed n feed is a slow release granular fertilizer to maximize the beneftis during the hotter, drier summer months. Application #4- Late Summer Weed N Feed- Mid August - Putting down a late summer weed n feed helps keep your lawn green, weed free and lush after a summer of foot traffic and the heat. Application #5- Fall Weed N Feed- Mid September- Fall fertilizer helps get your lawn to it's peak just before winter. Application #6- Winterizer- Mid October- Winterizer helps put your lawn to rest by sending the roots deeper before the winter sets in. Deeper roots give it a better chance at surviving our harsh winters, weather they are dry or wet. Putting down winterizer will help green up your lawn faster in the spring. Although 6 applications are listed, each season & lawn is different so it's hard to nail down a specific date and sometimes not all 6 applications are needed. We work with you and for your lawn to achieve the maximum results to give you a great looking lawn all summer long and only fertilize as needed. Call us at 612-508-9435 or click on 'Contact Us' button and we can set up a time to view your lawn to come up with a program. The 'hole' truth about aeration. On a scale of 1 to 10 core aeration is an eleven for improving your lawn’s quality. Lawns can be aerated anytime throughout the growing season. Spring, summer and fall each offer their own unique advantages. Aerating your lawn is a great way to reduce thatch, loosen up compacted soil and make it easier for nutrients to reach the roots. Even the best of lawns can thin out or lose color due to thatch build up and foot or pet traffic. Aeration is the best treatment. It is a standard practice of golf courses across the country. 1 – Save on your water bill. 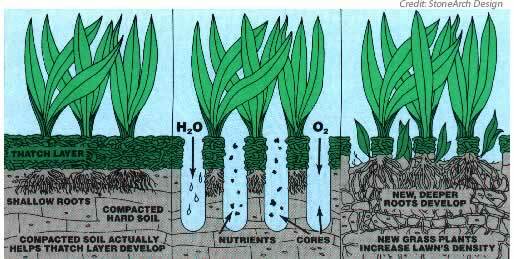 Water is able to get to roots faster with aeration and less will be lost to runoff, thatch or evaporation. 2 – Reduces thatch. Aeration speeds up thatch breakdown by mixing the soil and organic matter with the cores that are pulled. 3 – Creates deeper, healthier roots. With all the holes created it makes thousands of pockets for the roots to spread out and grow deeper, thus creating a healthier, thicker lawn. 4 – It loosens hard compacted soils. Aeration decompresses your soil by allowing the soil to expand while at the same time creating looser soil for root structure. Call Todd now at 612-508-9435 or click on 'Contact Us' above for a free estimate. Dethaching is commonly done in the spring, but can be done anytime your thach layer is getting to be too much. Dethaching is basically raking your lawn. Raking out the dead grass that has not broke back down into the soil. After a long winter it's good to dethach to help get the grass upright and also so water, fertilizer and air can get to the soil and help jump start it for the summer season. We typically go over your lawn a few times, paying special attention to matted grass, damage from vols and snow mold. We then bag up all the 'thach' and haul away. Please call for a free estimate. Spring Clean- Blow out rock, mulch beds bag up and haul away. Fall Clean-up- Blow out leaves in mulch and rock beds. Mulch up leaves, bag and haul away. Todd's Mow N' Plow can help you trim your bushes and shrubs. Todd's Mow N' Plow can help your business, home or association with your plowing needs. Contact us for FREE ESTIMATES, we proudly serve the following cities in the winter - Maple Grove, Plymouth, Brooklyn Park, Brooklyn Center, Crystal, New Hope and Champlin. We also do lot sanding and salting.